Observed on a tree trunk at night about 150 cm above the soil. In a homestead garden, Kapenguria, Kenya, July 2014. 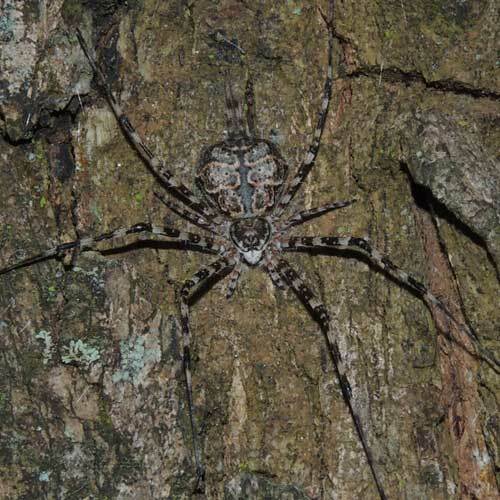 Also commonly known as tree-trunk spiders, two-tailed spiders are inhabitants of the tropics and subtropics on all the continents. A pair of long silk-producing spinnerets from the end of the abdomen give the name. With precise camouflage they wait at the center of a fine web spun right onto the surface of a tree's bark or other surface. When a prey insect stumbles into the web the spider rapidly runs around it releasing copious silk to entangle it before delivering a bite with venom. This female (left) and male (below) were set up about 12 cm apart. 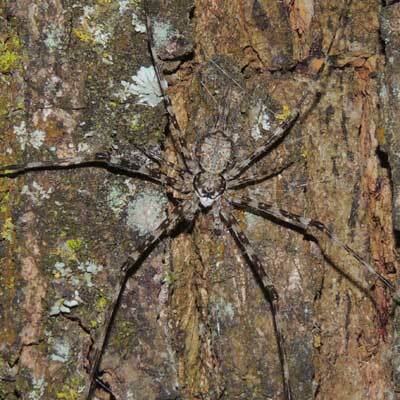 This adult male was observed on the same tree trunk at night in close proximity to the female spider. Kapenguria, Kenya, July 2014. Copyright Michael J. Plagens, page created 11 March 2015.